“Your speedboat will be arriving shortly to take you to the jetty where your over the water bungalow is located,” is a sentence I don’t hear nearly enough I decide. Those last two sentences remind us why we should hear the first more often – and chill the heck out generally. But back to the speedboat. It’s a monster with four hundred horses strapped to the back, which make short work of the journey to nearby Pangkor Laut Resort, a small island on the west coast of Malaysia. If you do go to Pangkor Laut Resort I recommend you arrive just on sunset.It really is a revelation of oranges and red over a darkening azure sea as we duck and weave along the coast and other islands before arriving at our destination lightly coated in a refreshing sea spray 15 minutes after the skipper gooses the throttle. 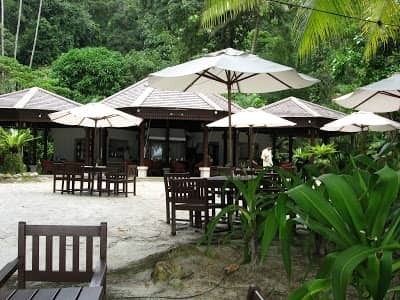 It’s time to settle into our Sea Villa, which is a luxurious air-conditioned timber affair on stilts, with a huge deck jutting over the Straits of Malacca looking towards Pangkor Island. There are shutters which open to give a full ocean view while maintaining complete privacy, if you don’t feel like wearing your cossie, that is – and it features a huge bath, and a massive rain-room type shower. Lie outside and soak up the sunshine and jungle warmth or shut the doors and stay cool while enjoying the view – it’s up to you. It sets new standards in luxury and I set new standards in relaxation for the next couple of days. The island is hilly and if you are going to Emerald Bay (on the other side of the island from the accommodation) for a dip, I recommend either whistling up or waiting for a shuttle for the four-minute drive. I never waited for more than a few seconds for one of the airconditioned SUVs to show up the whole time I was there. We don’t get around to going to Emerald Bay until the second day. I don’t recommend you delay it as long as I did, it’s worth the extra effort of sitting in an airconditioned SUV for four gruelling minutes to enjoy this magical place. There are hammocks strung up along the white sandy beach and the day I’m there the surf is gentle. The waves are easily getable for all levels of bodysurfers to kiss the sand. Make sure you grab a beer (or pina colada). If not, take luncheon, at Chapman’s Bar and salute a soldier who, despite being on a very sticky wicket indeed, made life very unpleasant for the Japanese who were thereabouts and playing for keeps at the time. The bar is named after Freddy Chapman who rendezvoused with a British submarine nearby during World War II after spending three years behind enemy lines. Make sure you keep your eyes open when you’re walking around the island. Everywhere we go we flush game. Giant monitor lizards only slightly smaller than Camrys, hornbills taking flight and of course monkeys. 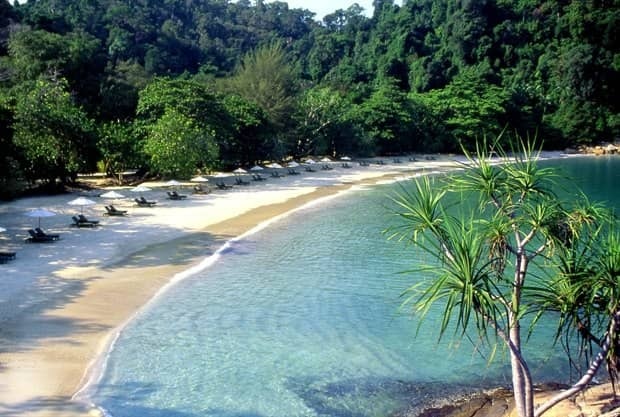 Pangkor Laut Resort is a worthy member of the Small Luxury Hotels of the World clan. Only go there if your idea of a romantic break involves cheerful unobtrusive service, a bewildering choice of fresh gourmet food of the highest quality prepared by the finest chefs and total and complete privacy for a truly intimate time with your life partner in a fecund jungle paradise combined with one of Asia’s most treasured, unspoilt beaches.